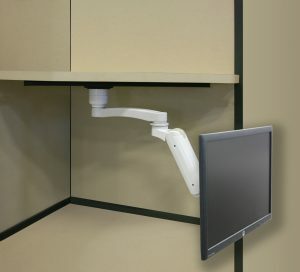 Monitor smoothly glides 28″ horizontally on an undercabinet track. Provides outstanding reach for an undercabinet monitor. Takes advantage of unused undercabinet space. 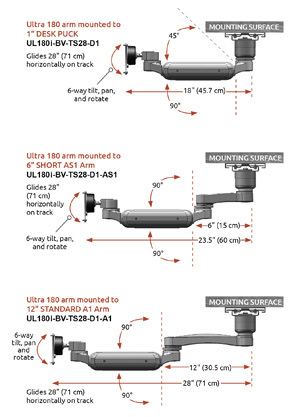 The unique and patented Ultra 180 arm provides 180° of vertical arm rotation and up to 270° of horizontal rotation for a monitor. ICW’s ball VESA adjuster provides the monitor with 6-way tilt, pan and rotate capability. The Ultra 180 stows snugly under the counter when not in use, making it the perfect choice for tight spaces. The Ultra 180 and 182 arms are protected by U.S. Patent 9,243,743. * Available in 5 standard and 9 custom colors. Call for information.